NASA’s Cassini spacecraft is in the middle of its final approach to Saturn, which is projected for this Friday, September 15, 2017. This dive into the planet’s atmosphere will be the bookend to a thirteen-year journey and its grand finale, which was a twenty-two week project during which Cassini conducted weekly delves through the liminal space between Saturn and its rings. Scientists predict that NASA’s contact with Cassini will fade out tomorrow morning at 7:55 a.m. EDT. Just one minute earlier, at 7:54 a.m. EDT, the spacecraft will enter Saturn’s atmosphere traveling at about 70,000 miles per hour. 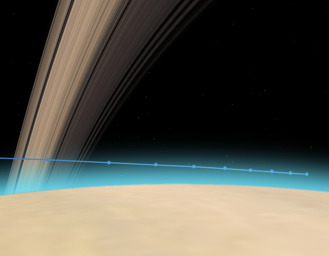 As it enters, the attitude control thrusters will fire to counter the thin gas and try to keep Cassini’s antenna pointed towards Earth in the final moments of contact. The thrusters will begin firing at 10 percent of their capacity and then will rev up to 100 percent in about one minute. But after they reach full capacity, they will no longer have power over Saturn’s natural forces and consequently the spacecraft will begin to tumble. During the tumble, the spacecraft will burn up like a meteor, then it will be dismantled, and then all the detached parts will be consumed by the atmosphere. This will all take a couple of minutes. Because of the time it takes for the radio signal to travel all the way back to Earth, our “coverage” of this event is 83 minutes slow. This means that though the spacecraft will stop sending us a signal at 6:31 a.m., the signal will continue to be received on Earth for another 83 minutes. Cassini will gather a lot of interesting data on its final dive. One of the most anticipated studies is its use of the Ion and Neutral Mass Spectrometer, which will directly sample the composition and structure of Saturn’s atmosphere, something than could not have been sampled previously by Cassini in its orbits. Live mission commentary and video from JPL Mission Control will air on NASA Television and the agency’s website from 7 to 8:30 a.m. EDT on Sept. 15. A post-mission news briefing from JPL is currently scheduled for 9:30 a.m. EDT, also on NASA TV.